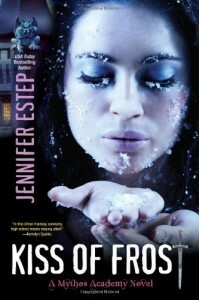 The Mythos Academy series by Jennifer Estep is such a cute young adult read. I like it because it's light, yet touches on all the important things for the Young Adult crowd-namely that it's ok to be different and be yourself. I also liked the message that everyone has different gifts and are given them for different reasons that we may just not know the reason for them right away. The characters in the series have become like old friends, and it was wonderful seeing Professor Metis, Nickamedes, Daphane (Gwen's best friend) Colin, and Logan again. I think my problem with loving the characters so much is that I wanted to see more of them. I think it would have been nice for Gwen to have included them a bit more in her quest (I especially wanted to see more of Logan) to find out who the reaper after her was, but realize that this book was more about Gwen finding out about herself and what to do with her growing powers. Gwen is one of my all time favorite young adult heroines. She's vulnerable, yet tough at the same time. She's vulnerable in that she doesn't know why the guy she has a massive crush on, Logan doesn't like her back. She is mostly ok with being invisible at her Mythos, but at the same time would like to fit in more. Her new power of being able to touch someone or an object and see the past is growing, and realizes that it makes her stronger and tougher, but struggles not to abuse it or cause it not to let her get close to her. She knows that her best friend Daphane, Colin and even Logan are there for her when she needs them, but is tired of asking them for help all the time. I really enjoyed how we get to see the world the students, who are all Spartans, Amazons, Vikings or Valkyrie's through Gwens eyes. It made connect with Gwen more and realize how hard it was for her to fit in there. I loved watching her grow through this book. The only thing that I couldn't wrap my head around was why Gwen kept referring to everyone as their race: Daphane was the Valkyrie, Logan was the Spartan, etc. I'm sure that this was probably done for those who were unfamiliar with the series, but it got to be a bit much by the end of the book-in fact I still think of Daphane as the Valkyrie instead of as Daphane. Aside from that small thing though, this series continues to be one of my favorites in the Young Adult Genre. I can't wait to see what adventures Gwen and her friends will go on next. "I stared at him. "It'll be okay, I promise. No matter what I see or feel. You'll still be Logan and I'll still be your gypsy girl."